I apologize for being incognito for the past few days. I have been down and out with a bad cold and I’m only resurfacing now. I think it’s only fair to write, now that my brain is functioning again. 😀 So here I am. And since I haven’t done an Ear To The Ground entry for a bit, I figured – why not now? 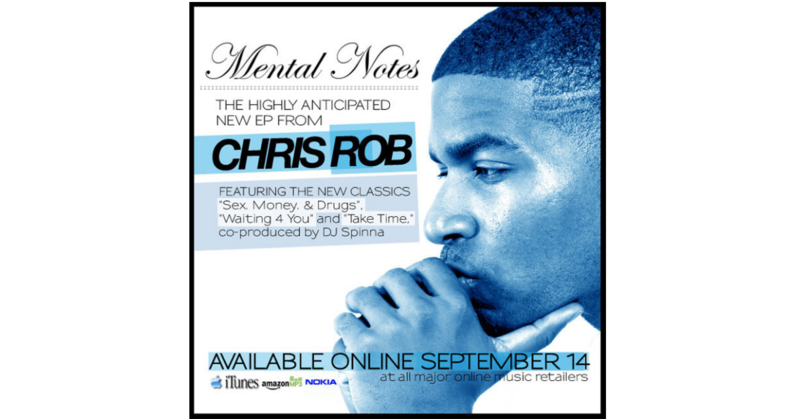 Not too long ago, I wrote a review on Chris Rob’s show at Blue Note. He was energetic, passionate, soulful, spirited and I could go on. I received his new EP Mental Notes and may I say, it is stupendous. My first exposure to Chris Rob was while he was on tour with Laura Izibor last year. I met him, did some research and checked out out his album, The Official Bootleg Of Chris Rob Vol.2. Well, ladies and gentlemen, this EP is giving me good face. This EP was too short for me. I was looking for more, once the EP was over. Nonetheless, it is cohesive and brilliant. Infused with funk and grand instrumentation, this is an EP for your collection. Mental Notes was released on September 14th, click here to find out more info on purchasing the EP.